What? Can't hear you ! Earplugs aren't exactly the most exciting thing to review. And yet, despite that, these humble little blobs of foam are probably one of the most important pieces of personal equipment you can buy. Why? Because hearing loss is, frankly, a pain in the backside. I speak from experience - the first part of my life was a riot of helicopters, guns and motorbikes, with the occasional loud rock gig thrown in for good measure. Back then, people simply didn't wear earplugs, especially not on bikes, and the result is that I am well on the way to being deaf. Now I'm not being alarmist, but the simple truth is that if you ride at any half decent speed then it doesn't matter how good your helmet is, or how quiet it seems. The sound pressure inside that lid is causing damage to your hearing. And that can't be good. Earplugs divide bikers in the same way as do Harleys. You either love them or you can't see the point - there are very few fence-sitters. And one of the biggest reasons I hear for people not using earplugs is that they're either uncomfortable or they don't work properly. Sometimes both. And I get that, I really do, because I've had the same experience in the past. Dave Marshall gets it too. He's the boss at Ultimate hearing Protection, and back in 2001 he went out to get some decent earplugs to use on his bike and for clay shooting. He wasn't looking for gadgets or technology, just good, comfortable, effective earplugs. And he really struggled. So much so, in fact, that he got a set made. And they were rubbish - the fit was fine but they were too soft. The trouble was that most earplugs a few years ago were actually made by hearing-aid manufacturers, and while they were fine in many circumstances, when you put them under a helmet they stopped working. It's obvious really. You put your lid on and your ears get squashed. Sometimes a lot, sometimes a little. But there's always something that happens. Time for a change of approach. Dave got on well with the chap who did the moulds for his custom plugs. In fact, they became friends and decided that they could do better between them. So they set out to make better earplugs for bikers and other folk. They worked through a series of what would best be called field modifications until they finally hit on the combination of softer silicon to work best in the ear canal and a harder outer shell to help retain shape. They did bike shows and shooting shows, eventually attracting the attention of one of the larger users of hearing protection in the UK - the Ministry of Defence. The rest, I suppose, is history. they supplied all the UK forces going to Afghanistan with hearing protection, and that means they have to make stuff that works and is easy to use. The same philosophy they apply to their bike kit, in fact. 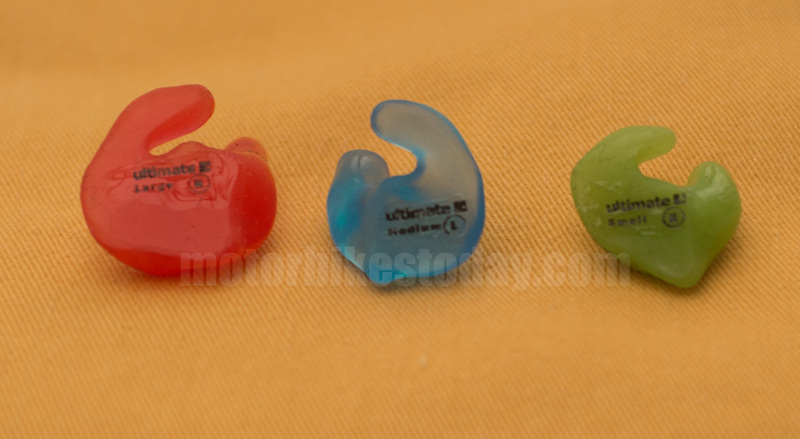 Now moulded earplugs are expensive, and though I've used them before the results are inconsistent. I've used DIY ones which are actually quite good but they are still too soft and when you put your helmet on you can actually hear the seal break a lot of the time. Not always, though. I've used proper moulded for me silicon ones which, with a speaker and a mic boom, were fantastic. As a hands-free kit in the car. Under the helmet, I'm afraid, they were rubbish. So much so that we agreed not to review them at all because they were also bloody expensive. As a result, if I'm riding any distance or fast (or, more often, both) then it's foam rollup plugs for me. And that's actually not so good, because the noise reduction is a trade-off against them not actually being very comfortable. Especially if, say, I'm riding to the Nurburgring and back. 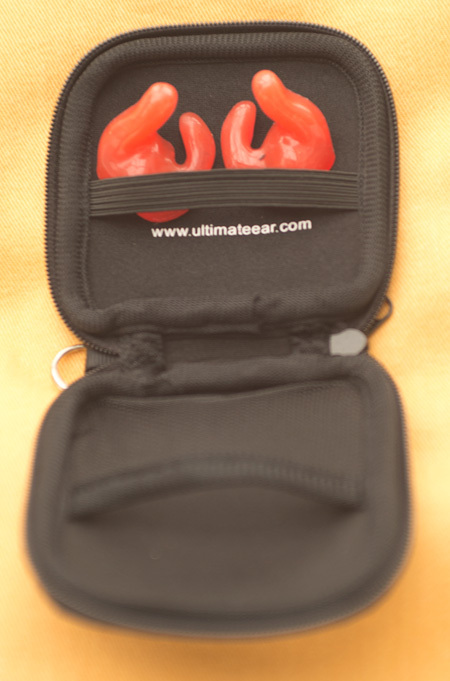 I recently saw Ultimate Ear at a bike trade show, and noticed that they were exhibiting pre-made moulded earplugs. After a brief chat I thought these might be worth a look, though I have to be honest and say that I was deeply cynical about them. They company sent me three sets - small, medium and large - with the suggestion that I should try the medium as they would "probably be about right." Well I tried them, and they were indeed about right. Actually that's not fair. They were exactly right. I've used a lot of earplugs and different types of hearing protection, and I can honestly say, without a shadow of a doubt, that these are the most comfortable and effective earplugs I've ever warn, inside a helmet or not. The sound reduction is astonishing, and even after wearing them for several hours I have felt no discomfort, haven't got all sweaty and haven't had that ringing in my ears which always used to denote a really good ride...and the loss of another couple of degrees of hearing. Copyright © Motorbikestoday.com 2014. All rights reserved. Users may download and print extracts of content from this website for their own personal and non-commercial use only. Republication or redistribution of content, including by framing or similar means, is expressly prohibited without the prior written consent of Motorbikestoday.